It's a bone of contention between film music fans to this day: which 1989 James Horner score most deserved the Oscar nomination – "Field of Dreams" or "Glory"? In an astonishingly good year for film music (also released were "The Abyss", "Henry V", "Indiana Jones and the Last Crusade" and "Batman", among others), both of Horner's efforts emerged strongly to develop a firm following... but which is best? It’s a question that can’t be answered, since each score is so brilliantly and intrinsically tied to its respective film. 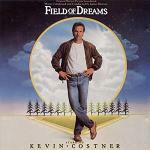 What can’t be argued though is Field of Dreams is unlike most Horner scores before or since. Whereas Glory is a deeply moving elegy to war, featuring some of the composer’s finest choral work, Dreams is more akin to something by Thomas Newman: ethereal, dreamy, moody but always building to moments of considerable power. It's perhaps this unusually featherweight quality that saw it clinch the Oscar nomination above Glory. Phil Alden Robinson's heart-warming fairy tale has become a staple of blokes cinema viewing since its release, being the tale of a rookie Iowa farmer (Kevin Costner in his most likeable performance) who starts hearing a voice saying "If you build it, he will come". Unsure who "he" is, Costner twigs that he is supposed to build a baseball pitch and lure the ghosts of an old baseball team to his home. Why remains unclear until the end but the film is so possessed of its own logic and sense of magic realism that it would take a churl not to enjoy it. There's strong support from Amy Madigan, James Earl Jones and movie legend Burt Lancaster – plus, of course from the scoring stage, Horner himself. The opener "The Cornfield" is an enticing one, featuring a typically warm trumpet sandwiched between synths and shakuhachi, before leading onto a simply exquisite piano solo which ambles along delightfully. It speaks of Americana, cornfields, good intentions and the mystical, all of which are central conceits to the film. Unlike Horner’s usual work, there is a theme in there but it takes the rest of the score to draw it out; rather than club you over the head from the start, Horner is more reserved here. The second track, "Deciding to Build the Field" marks the first of several unexpected deviations for the composer, venturing into soft rock territory and lending the fairy tale synthesiser and piano wash a decidedly modern edge. The mysterious "Shoeless Joe" plays around more extensively with electronic design, showcasing Horner's rarely heard ability in the field. "Old Ball Players" is a swing jazz piece, entirely appropriate for representing the resurrected sportsmen from another era while "The Drive Home" is the opposite, a touching piano theme undercut with palpable regret over Costner's lost time with his deceased father. Throughout, Horner showcases a willingness to experiment and blend contrasting styles together in a way he hasn't done since; it's a quietly poignant collage of conflicting ideas and emotions. His instrumental solos are also outstanding, especially the lovely acoustic guitar in "Field of Dreams", much more heartfelt than his more bombastic work. "The Library" brings back the pop stylings but with a funky baseline and greater sense of movement as Costner's cross country trip to track down Earl Jones bears fruit; while "Moonlight Graham" is the eeriest track with some moody piano work as Burt Lancaster finally makes his appearance (although, as we, all know, there's a twist...). This highly recommended soundtrack can be found at these locations on Amazon.co.uk and Amazon.com.